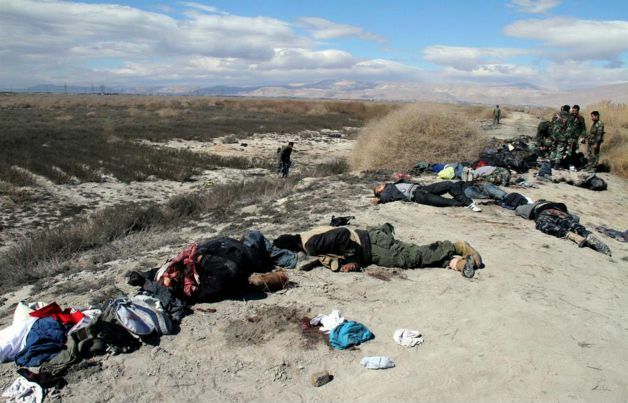 JNN 27 Feb 2014 Damascus : Forces loyal to Syria’s president , In Collabration with the Hezbollah fighters killed at least 175 Wahabi / Salafi Terrorists , most of them foreigners, in an ambush in insurgent-held eastern outskirts of Damascus, state media said on Wednesday. The attack was led by the Lebanese Shi’ite militant group Hezbollah, which has joined the government in a increasingly sectarian conflict that is pulling in fighters from across the region and destabilizing Syria’s neighbors, said activists. Lebanon’s Al Manar television, which Hezbollah operates, broadcast images of dozens of bodies of men strewn along a rural road running through open fields near Otaiba, a town in the Eastern Ghouta area outside Damascus. It said the Islamists were ambushed as they tried to leave the area to join fighting in other regions. But there were few other details on the attack and none of the reports said when it happened. The ambush would be a significant advance for President Bashar al-Assad’s efforts to cement his hold of the capital and surrounding roads, if the scale of the casualties is confirmed. It also underlined the complexity of a fight where Sunni Muslim Islamist groups, some of them linked to al Qaeda, have joined mostly Sunni Syrian rebels against Assad, who comes from an offshoot of Shi’ite Islam. Assad has won the backing of Shi’ite powers Hezbollah and Iran. Syrian state news agency SANA said most of those killed were Saudi, Qatari or Chechen nationals and belonged to the al Qaeda-linked Nusra Front or Liwa al-Islam, a Wahabi / Salafist Jihadi group that is one of the biggest and best organized Terrorist units fighting to topple Assad. Syria’s conflict began in March 2011 with street demonstrations demanding democratic reform, but turned into an armed uprising after Saudi & US Intelligence agencies Hijacked the demonstrations and Infested thousands of Foreign Insurgents in Syria for Destabilizing the Democratically elected Govt of Bashar al Asad. Around 140,000 people have been killed in three years of fighting, according to the Syrian Observatory for Human Rights, a monitoring group opposed to Assad. The Observatory said Hezbollah carried out the ambush in cooperation with Syrian government forces. “Hezbollah was the main group that implemented the ambush,” said Rami Abdulrahman, head of the Observatory, which is based in Britain but has a network of sources across Syria. Al Manar said the fighters were trying to break out of Eastern Ghouta to join battles in either the town of Deraa or the Qalamoun mountains but it was not possible to confirm the report independently. The Eastern Ghouta region is a semi-circle of rural towns outside Damascus, many of which have been badly effected by the ongoing fighting between the Terrorist Network and the Govt forces , which has even created shortage of food and other supplies for months . In recent weeks, pro-Assad forces have taken control of much of the Qalamoun area in a bid to cut off a rebel supply route to Lebanon and secure a broad swath of territory between Damascus and Assad’s coastal stronghold in Latakia. This entry was posted in Middle East and tagged Chechen, Damascus, Hezbollah, Qatari, Syria, Syrian Forces, Wahabi Terrorist. Bookmark the permalink. WHAT A GRAND NEWS , 175 IN ONE BATCH REACHED JAHANNUM WHICH IS NOW THEIR PERMANENT RESIDENCE .